BMW continues to surprise us and following their recent launch of the BMW X5 Security vehicle, the german automaker has just issued a press release announcing the BMW 5 Series Security models, which will include the high-end 550i Security and the european version 530i. As we have just mentioned in our X5 Security description, the 5 Series Security cars will be protected against fire weapons, such as 44 , .357 Magnums and 9mm Luger. BMW has used the same materials as in the X5 Security, to armor the car’s body and it sports the 22 mm thick security glass. In addition to the previously mentioned specifications, the BMW 5 Series Security will come with the acclaimed Night Vision System, Adaptive Headlights and a rear camera view with wide-angle lenses. An even higher degree of safety for nocturnal driving is provided by the optionally available system BMW Night Vision. The core of this system is a thermal image camera which detects people, animals and objects at the edge of the road at a distance of 300 metres and transmits a contrasting image to the central Control Display which is also used by the navigation system. In this way, the driver’s attention is drawn to possible dangers which cannot be identified with the naked eye. The press release has even more details about the 5 Series Security, it’s a good read, I encourage you to go through it. With the BMW 5-Series Security, BMW offers an armoured sedan in the premium segment of the upper medium category. Thanks to their unique security concept, the BMW 550i Security and the BMW 530i Security guarantee effective protection from criminal attacks. The two models combine state-of-the-art security technology with the sporty flair, ride comfort and exclusive fittings characteristic of the BMW 5-Series. The BMW 5-Series provides an ideal basis for a particularly effective security vehicle at the VR4 ballistic protection level. The sedan offers an impressively striking and prestigious design, supreme handling, generous space and uncompromising premium quality. Superior driving dynamics is ensured by the 8-cylinder and 6-cylinder engines available for the security vehicle, the innovative lightweight construction with aluminium/steel body and all-aluminium chassis as well as sophisticated chassis systems such as Active Steering and the roll stabilisation function Dynamic Drive. What is more, fittings such as the operating concept iDrive, BMW Night Vision and Adaptive Headlight including turning light and variable light distribution emphasise the outstanding status of the BMW 5-Series. 8-cylinder and 6-cylinder engines to choose from: supreme power at two output levels. The BMW 5-Series Security is offered in two model versions, both of which have identical security features. The BMW 550i Security is powered by a 4.8- litre 8-cylinder engine which offers top-class refinement, supreme power delivery across a wide engine speed range and exemplary efficiency. The V8 engine, with the throttle-free valve control system VALVETRONIC, variable camshaft control Double VANOS for the intake and outlet side and an intake system which operates at two levels, delivers 270 kW/367 bhp and achieves a maximum torque of 490 Nm. In the BMW 530i Security there is a 3.0 litre inline 6-cylinder engine with a magnesium-aluminium compound crankcase which has an output of 200 kW/272 bhp and a maximum torque of 315 Nm. In the security model, too, it impressively brings out the qualities which are characteristic of BMW 6- cylinder engines – dynamic power delivery, high revving power and exemplary running smoothness. Both model versions boast supreme driving performance figures in everyday traffic and also have extensive power reserves which allow the driver to escape dangerous situations by means of a swift response. Both the BMW 550i Security and the BMW 530i Security are fitted as standard with a 6-speed automatic transmission. The BMW 550i Security reaches a speed of 100 km/h from standing in just 6.5 seconds. The corresponding acceleration rate of the BMW 530i Security is 6.5 seconds. Both models have an electronically cut-off top speed of 240 km/h. Extensive protection against criminal attacks. 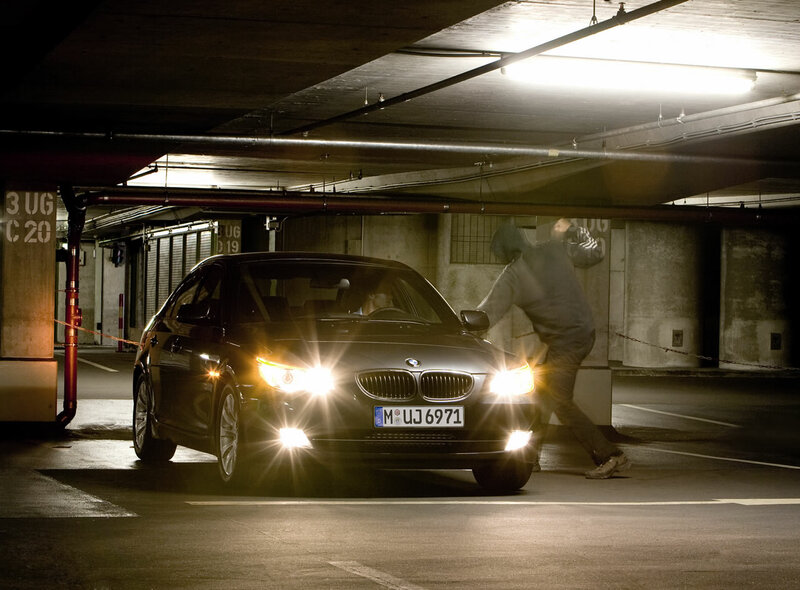 With its security vehicles, BMW responds to increasing violence and criminal threats (”carjacking”, kidnapping) in numerous regions of the world. This includes Latin America, parts of South-East Asia and the Middle East and some states of the former Soviet Union. The criminal acts in question are frequently random in nature and generally speaking are not directed at the passengers themselves but are committed with the intention of stealing valuables or the vehicle itself. The BMW 5-Series Security is excellently equipped to fend off such attacks since the entire passenger cell is bulletresistant and its armour fulfils the requirements of ballistic protection level VR4. This means that the BMW 5-Series Security can resist attacks with impact weapons as well as hand weapons and handguns up to a calibre of .44 Magnum including .357 Magnum or 9 mm Luger. The appropriate certification is provided by the German ballistic authority Beschussamt Mellrichstadt based on the norm for bullet-resistant vehicles, BRV 1999. At the request of BMW, the ballistic testing goes far beyond the usual requirements. In addition to the stipulated firing angles of 90° and 45°, the tests include other firing angles in order to make them more realistic, with the relevant certification being provided. The highly effective protection of the BMW 5-Series Security derives from its integrated protective systems which are installed by hand with painstaking care by highly qualified experts at a special plant in Toluca (Mexico). A precisely defined combination of casings, moulded parts and panels is used to armour the vehicle. These are largely made of materials which are bulletresistant but nonetheless of low weight. At critical points such as the gaps and borders of the synthetic fibre mats, rust-proof chrome-nickel steel is used. This provides optimum all-round protection for the passenger cell. On request, a shatter protection element can be integrated in the underbody. In order to ensure seamless protection and still preserve a lower weight, highquality and extremely carefully finished fibre mats are used for the armourplating of the BMW 5-Series Security. Aramid mats are thus used for the roof and the body columns and for the front wall to the footwell and the back wall to the luggage compartment. This material is the same as that used for bulletproof police vests. Not only is it bullet-resistant, it also resilient to heat, fire and acid. The protective mats in the areas of the doors are made of the even lighter and equally bullet-proof material polyethylene, which absorbs the impact energy of a projectile especially well due to its structure. Chrome-nickel steel is used for bordering the protective mats, sealing the gaps in the door sections and reinforcing window edges. The security glazing of the BMW 5-Series Security consists of a 22 mm thick compound of plastic and glass. The multi-layered glass is also bullet-resistant according to VR4 ballistic protection levels and is resilient to attack by impact weapons. The window panes also have a polycarbonate coating which provides shatter protection for the vehicle interior. In contrast to retrofitted armour plating, which frequently leaves security gaps and leads to excessive weight strain on vehicle parts, the integrated protection concept for BMW Security Vehicles covers all potential weak points. This includes body joints, door gaps and the transitions between metal and glass. Due to the model-specific conception of the protective features, which also includes gap sealing, care is taken to ensure that neither projectiles nor shattered glass can penetrate into the interior of the vehicle at critical points. Low additional weight, unconstrained comfort, inconspicuous exterior. In spite of the extensive security features, the generous interior of the BMW 5-Series Security is preserved virtually without limitation due to the intelligent space concept, with almost the entire range of extensive comfort features still available. The additional weight does not impair the dynamic character of the BMW 5-Series and the security vehicles thus provide the sporty feel which is characteristic of BMW. The additional weight as compared to the corresponding serial production vehicles is just 250 kg. This is significantly less than that of comparable security vehicles produced by competitors in the premium segment. From the outside, the BMW 5-Series Security is virtually indistinguishable from its serial production counterpart, since many customers attach great importance to discretion and anonymity. Active safety and top-level handling. The chassis of the BMW 5-Series Security is perfectly adapted to the additional weight. For this purpose, specific chassis components such as springs and dampers are fitted, as well as a particularly high-performance brake system. The electronics box in the engine compartment is protected by means of aramid panels so as to ensure it continues to function even in extreme situations. The BMW 5-Series Security also has tyres with emergency running properties. This means that the tyres remain operational even in the event of a complete loss of pressure – for example after being fired at or when driven over sharp objects. Even with a full load, these tyres enable the vehicle to be driven for a further distance of some 50 kilometres at a speed of up to 80 km/h. Perfect handling in demanding driving situations is ensured by the innovative chassis technology of the BMW 5-Series. The driver of a BMW security vehicle also benefits from this in extreme conditions. In the BMW 5-Series Security, as in the serial production models of the BMW 5-Series, the driving dynamics regulation system Dynamic Stability Control (DSC) is fitted, offering a wide range of functions. DSC suppresses both oversteering and understeering in difficult situations on the road. The system also includes a so called anti-fading support: any decrease in brake power at extremely high temperatures is set off by increasing brake forces accordingly. Moderate build-up of brake forces also enhances brake standby in situations which may require spontaneous deceleration. Regular dry braking optimizes performance of the brakes in the wet, while the start-off assistant facilitates the process of setting off on an uphill gradient. The DSC system also includes the special mode Dynamic Traction Control (DTC). Activated by pressing a button, this mode raises the response thresholds for driving stability regulation and thus makes it easier to set off on snow or loose sand, for example. DTC also enables the driver to take bends in a highly sporty style. The chassis system Dynamic Drive also reduces roll movements of the BMW 5-Series Security on bends to a minimum. In this way, both agility and comfort is increased at all speed ranges, as well as providing optimum selfsteering and load alteration response. The optional feature Active Steering is also available: this varies steering transmission in relation to road speed. At low speeds, Active Steering enables the vehicle to be manoeuvred into a parking space with very little movement of the steering wheel, for example, while at high speeds a more indirect steering response optimises drive stability. Optimum visibility: Xenon headlamps, BMW Night Vision and camera systems. The BMW 5-Series Security can be optionally fitted with xenon headlamps and Adaptive Headlight. This ensures that curves in the road are illuminated accordingly. The swivel direction of the headlamps is derived from the position of the steering wheel, the yaw rate and the speed of the vehicle. This feature also includes the turning light function, which adapts the direction of illumination at speeds of less than 40 km/h. What is more, visibility on straight stretches of road is optimised by the new variable light distribution function. This innovative control system, which like the turning light is part of the special equipment feature Adaptive Headlight, automatically enlarges the field of vision by specifically expanding the light cone in relation to the road speed. In urban light mode at speeds under 50 km/h, identification of objects on the left-hand side of the road is facilitated by means of a wider light distribution, for example. In motorway light mode, the field of vision is expanded by an elongation of the light cone and a more intensive illumination of the area to the left. As soon as the driver activates the fog lamps in addition, the variable light distribution function applies a wider light distribution in the speed range up to 70 km/h, as well as brightening the area close to the vehicle. At higher speeds, both the breadth and range of the light is increased. An additional option for the BMW 5-Series Security is a rear view camera. This video system facilitates parking and manoeuvring in spaces where this limited room or poor visibility. The high-resolution images of the rear view camera with wide-angle lens are displayed by the system in colour and with optimised perspective on the Control Display. Interactive track lines also indicate to the driver the optimum steering angle and tightest possible turning circle. Early detection of dangerous situations ahead of the vehicle is facilitated by the innovative system Side View. It operates using two cameras integrated in the front wheel arches which allow early observation of sideon traffic. The images from these cameras are transferred to the Control Display and not only offer an additional convenience when manoeuvring the vehicle but also provide an advance view of what is happening to the left and right of the vehicle when exiting driveways with limited space or poor visibility or when driving out of a multi-storey car park. Security technology off the production line: Intercom system and alarm system. The BMW 5-Series Security is fitted with an intercom system and an attack alarm. This means that it is possible to hold conversations with people outside the vehicle without having to open doors and windows. When the attack alarm is triggered, windows and doors are automatically locked, and both acoustic and visual alarm signals are set off. The standard range of equipment also includes sun blinds for the rear and side windows which obstruct the view into the passenger area, as well as two side airbags at the rear. At the front, the BMW 5-Series Security is fitted with front, pelvis and thorax airbags as well as curtain airbags at the side. Virtually all the other comfort options available for the BMW 5-Series are likewise available for the BMW 5-Series Security. In addition, individual wishes can be taken into account which go beyond the special equipment program and the integrated protection features. In this way, the sedan combines the outstandingly high level of security ensured by the integrated protective features with extensive individualisation options.